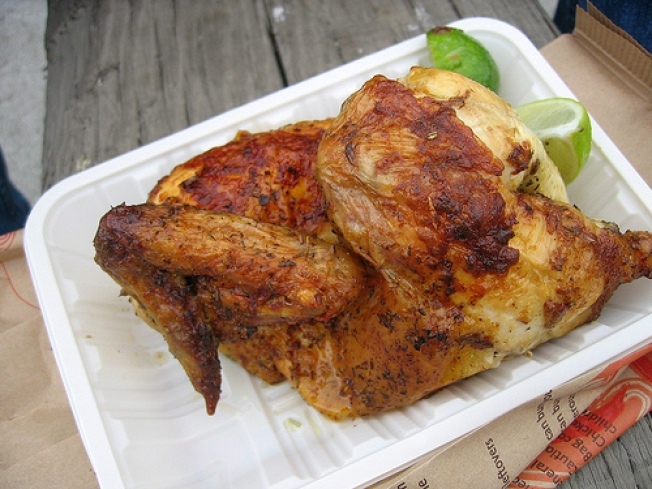 Herbed rotisserie chicken with lime from Roli Roti at the Ferry Plaza Farmers Market. One of my favorite things to do in San Francisco is to visit the Ferry Plaza Farmer’s Market early on a weekend morning, and try a little bite or two from each vendor until I’m full. I have my favorites, but there was always one vendor in particular that my friend Dominic and I wanted to try, Roti Roti, and passed on each visit because of the long lines. I’ll come back next time when the line isn’t so long, I’d think to myself each time. The last time we visited, we gave in and waited with the crowd until our turn came up. We chose Roti Roti’s herbed rotisserie chicken with lime. The smell was intoxicating. Crispy on the outside and juicy on the inside, Dominic and I took a seat by the bay and snacked on our chicken while we people-watched the crowds. Most rotisserie chickens are good, but Roti Roti’s is great. And the wedge of lime they include with the chicken? It may look like an unassuming garnish, but that hit of citrus was so good against rich meat, and a welcome change from the more traditional lemon. After we finished, we had to hold ourselves back from returning to Roti Roti for seconds. After all, we had more vendors to sample and what’s a visit to the Ferry Plaza without the requisite sampling (and occasional overindulgence)?